You must be a member of the Mexico City Games Group to attend this activity. Would you like to join this group? 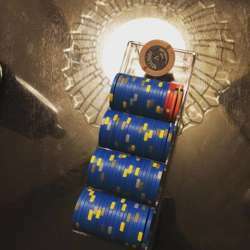 A few folks have requested a relatively high-stakes game of Texas Hold 'Em as compared to the other ones we've had so far, so I'm scheduling this tentatively, to gauge interest; it will be no-limit hold 'em with MXN Protected content + 5/10 blinds. Casual players are welcome to attend, but PLEASE do not register if you are not VERY confident that you can attend AND arrive on time--having too few or too many players can ruin a game, and when playing with blind bets, late arrivals are unfair to the people who are on-time.